For the 2017 model year, the 2017 Toyota Sienna’s V6 motor gets an additional 30 horsepower, as well as direct-injection technology. On top of that, a new eight-speed automatic transmission replaces the old six-speed gearbox that was standard on last year’s model. This all means better acceleration and increased fuel efficiency at an impressive 29 mpg on the highway. 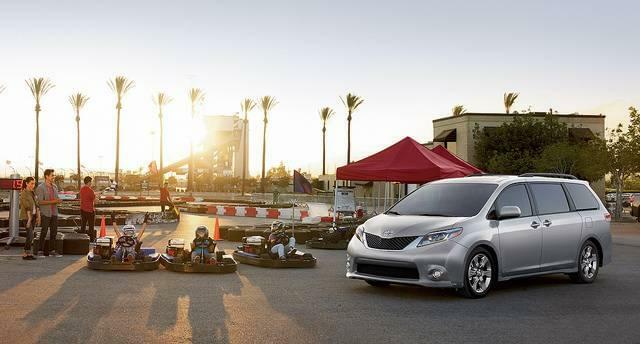 The 2017 Toyota Sienna is the ideal vehicle for families in need of lots of cargo room. When all of the seats are upright, there’s 39 cubic feet of storage space behind the rear seats. However, with all the seats folded down, the new Toyota Sienna provides an incredible 150 cubic feet of maximum storage space. In addition, the 2017 Sienna is available with a Dual-View Blu-ray Disc™ Entertainment Center that comes with a 16.4-inch color display screen, two wireless outlets, a remote, two 120-volt AC power outlets, and RCA jacks. With this system, kids should never get bored or restless during long road trips. Even the entry-level version of the new Sienna comes standard with Toyota’s famous Star Safety System™. This bundle of six advanced safety technologies helps prevent accidents and limits driver error. The Traction Control (TRAC) and Enhanced Vehicle Stability Control (VSC) systems use multiple sensors and advanced computer tech to keep the Sienna under control in difficult weather conditions. Additional safety features that come standard and also provide added safety include an Anti-lock Brake System (ABS), Electronic Brake-force Distribution (EBD), Smart Stop Technology® (SST), and Brake Assist (BA).